For all of us at PlayStation, it was so exciting to see the positive response from the community to last month’s PlayStation Classic announcement. Today we are happy to reveal the entire lineup of the 20 games that come pre-loaded on the console when it launches in the U.S. and Canada on December 3. 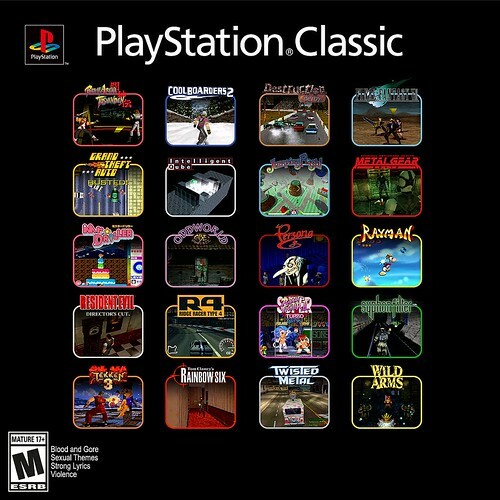 PlayStation Classic offers these 20 amazing games, two controllers, and many hours of fun. If you haven’t pre-ordered already, visit PlayStation.com for availability in your region. Enough goodies to make you take the plunge? Unlike the Atari 2600 flashback systems, I don't think I would play enough of these to make it worth the $99. Not many games on there that make it worth it I'm afraid and a few of the good ones I already own on PC. Silent Hill<-- This one alone would have made it worth it. Really thought for sure Twisted Metal 2 would have been the pick. TM1 didn't really blow the world up. And Persona 1 is definitely an odd one for the states. Maybe some weebs would be curious but it does not hold up well and it's extremely different from the later titles. Yea, I agree that it is pretty much criminal that Silent Hill is missing. The few snippets of "Rayman" and "Super Puzzle Fighter II Turbo" show the difference between vector- and pixel-based games quite nicely. The former simply don't hold up after 20 years and 3 console generations, while you can still look at the latter without going blind. There are a bunch of interesting games here, but unless you're a historian, most are simply not worth replaying. Great list! I'm looking forward to it! You had me at Destruction Derby. They had me at Intelligent Qube. Scrounging eBay, you'd be paying nearly half the cost of the PS Classic for a complete version of this game by itself, in most cases. This is a sad sad list. You had me at Mr. Driller. But actually.... not sure I can justify this. Twisted Metal 2 would've swayed me more. Also as others have said Silent Hill. Damn, I don't think I'll end up getting this after all. We'll see. FWIW PSOne is one of the best-emulated consoles in existence, better even than SNES. Mednafen for PSOne is essentially perfect, some argue even more perfect than the real hardware (don't ask me to quantify that claim). Just throwing it out there, I know people are still going to buy it no matter what I say. Fantastic list with a glaring omission: Castlevania Symphony of the Night. Are there other games I would prefer there, over some of the more niche titles? Of course! But SotN is one of the defining titles for the PSX, more so than Chrono Trigger was for the SNES. Intelligent cube is F'ing awesome! Shouldn't have preloaded games. Should include digital credit for 20 downloadable games of your choice. Make the damn system worthwhile for your fans, you idiots. This just makes me want an Atari Flashback or a C64 mini that isn’t mini. I would love a C64 with HDMI output and the full size C64 keyboard. I like this idea, but not all of these titles are available in the US Playstation digital shop. Ideally, 20 preloaded games with the ability to legitimately add more would be perfect. Considering Castlevania: Reqieum just came out four days ago...I'm guessing Konami didn't want to bundle one of their most-beloved titles for "free". I still have my PS3 and it plays all these games. Plus anything else I want to play from that era. It's a pass for me, but more power to those who like it.